Your core is more than just your abs, it's most of the muscles in your torso, including your side muscles (internal and external obliques) and back muscles (quadratus lumborum), as well as your diaphragm, and planks are a great way to work all of the muscles together. A strong core can help you maintain balance which in turn leads to improved form in other exercises which is necessary for safety as well as effective results from those exercises. The plank might be an old exercise, but just because it's not 'new' doesn't mean it isn't effective. Oldies are often goodies. Unlike the crunch, the plank involves your hips, shoulders and chest as well as your abs, and when lots of muscle groups are getting involved, you also burn more calories as more energy is needed. 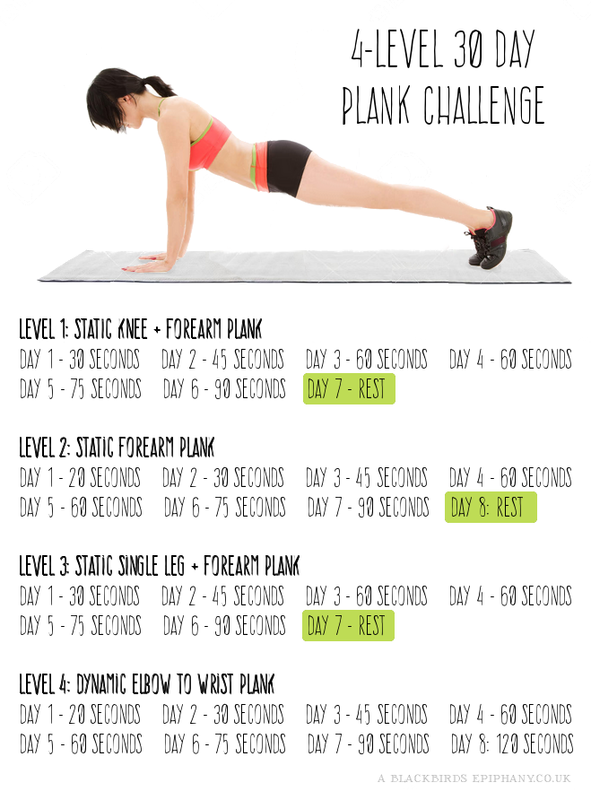 The 30 Day Plank Challenge is a simple concept. A plank looks easy, but anyone who's done one can attest to the fact that it isn't. Your body is kept straight throughout the exercise and your muscles tensed to maintain that form, and the challenge is essentially to build up your stamina and hold the plank for longer and longer. The Challenge is not a substitute for a workout, but is supplemental, meaning you should add it on to your main workout for maximum benefits. Simply holding a plank for even 5 minutes won't give you an effective full-body workout. A plank is also a fantastic push-up assistance exercise, along with chest flyes, bench presses, burpees and bent-over double rows, so if you're working towards being able to pump out 20 push ups in a row, this will help. Planks are also a really versatile exercise, and there are loads of variations. If you can already hold a plank perfectly, you can choose a more challenging variety like a side plank and run through the challenge with that instead. The simplest method of the 30 Day Plank Challenge is to simply hold a basic plank (toes and hands, or elbows and knees if you're not strong enough) for a set amount of time every day for 30 days, the times for which are listed below. An alternative variation is to work through levels, moving onto the next level when you're able to hold the previous level's plank variation for 90 seconds. Do whichever you're comfortable with. The 4-level version is harder in some ways, but also uses a beginner's variation for the first 7 days and only encourages you to reach 90 seconds, whereas the simpler version is just one position, but encourages you to reach 5 minutes by the 30th day, either on your forearms or hands, but always on your toes. • Extend your arms beneath you, keeping your arms straight and vertical, your elbows and wrists beneath your shoulders. Alternatively if this is too hard, you can hold yourself on your elbows instead, just ensure your elbows are straight beneath your shoulders, upper arms perpendicular to the floor. • Lift yourself onto your toes and hands (or knees and forearms) and contract your abdominal, glute and thigh muscles while breathing as normally as you can. Keep your muscles contracted throughout the pose. Think about pulling your bellybutton into your spine throughout the move to ensure you maintain the contraction. • Hold the plank for the allotted amount of time for the day. Static knee & forearm plank: keep your body straight, but rest on your knees and forearms rather than toes and hands. Static forearm plank: rest on your toes and your forearms. Static single leg & forearm plank: rest on your forearms and the toes of one foot, extending your other leg out straight behind you and hold. Dynamic elbow to wrist plank: staying on either your knees or toes, move from a plank resting on your forearms to a plank on your hands, then lower back to forearms, then back to hands repeatedly.